On this episode Paul sits down with Stanley Liebowitz, a professor of economics at University of Texas at Dallas. Liebowitz is co-author of a report which reconsiders the issue of state education rankings. Dr. Liebowitz shares why he sees the issue of education rankings as critical and how they often mis-measure the real impacts of education systems from state to state. 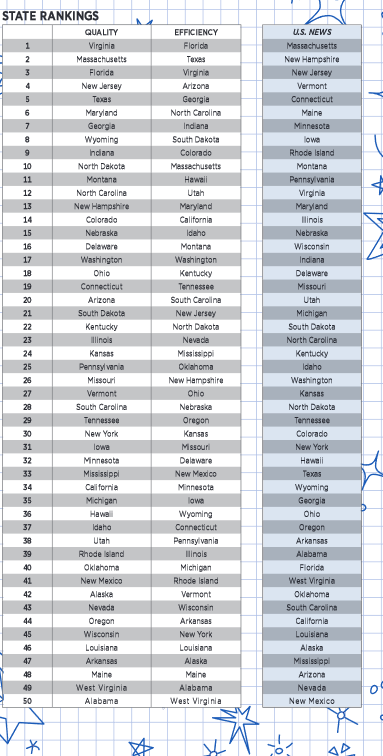 You can see how New Mexico “really” stacks up in the chart below or at the link above. And this group wants to eliminate charter schools, the best alternative for the disadvantaged after vouchers; and waste funds on “early education” (day care) that we have seen for over 25 years has no long-term advantage. Better approach would be to help families learn how to care for children, and start school at age 7. Following a program by 4H would help, also.